I might be alone on this, but I think it looks good	If we must spend $43 billion on a National Broadband Network, shouldn’t the regional centres be getting priority over well-serviced areas? 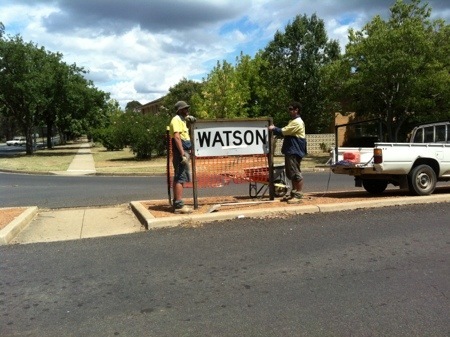 Last week I reported that the old Watson suburb sign at the corner of Knox and Antill Streets had been removed to make way for one of the new style suburb signs. The old sign was taken down on Thursday last week around lunchtime, and the frame for the new sign was put in a couple days later. Today, a week after the old sign was removed, the new sign was put in. 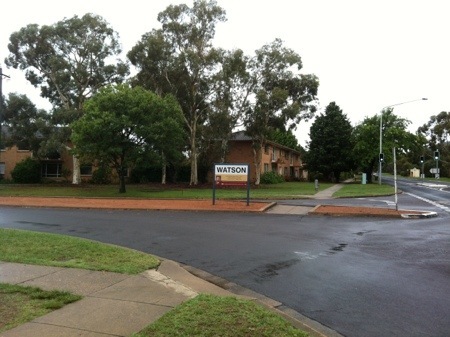 This photo was taken from the opposite side of the road to the photo I took of the old sign last week. 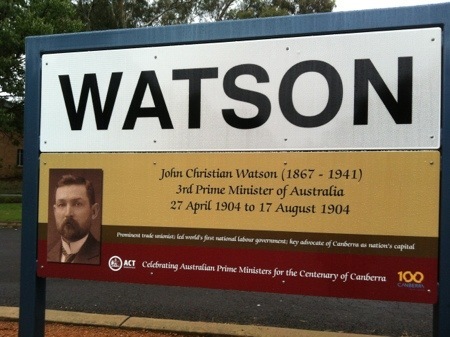 The new style of sign contains a little bit of information about the person after whom the suburb of Watson was named, Prime Minister John Watson. It is certainly different to the old sign, and as nice as the new sign is, I will miss the old one.